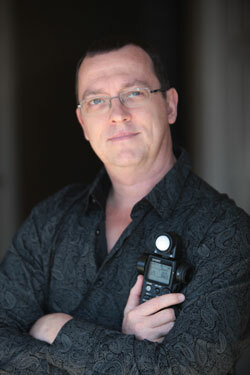 Jim Ross is a digital cinematographer with over two decades experience working in video and motion pictures. He has filmed across the United States, Mexico, Europe, Africa and Asia, filming a diverse range of subjects from Baja racing to cooking shows, from fitness pros to wild elephants, from TV commercials to television pilots, and much more. Jim began working in video when the first large format camcorders hit the market in the late 80’s. Realizing his “hobby” had revealed a natural talent, Jim practiced and polished his craft by working on the sets of independent films. It was there he learned about lighting, composition, and cinematic camera work. He also worked at the Atlanta public access station as a cameraman, audio engineer, director and other positions so he would learn all he could. Jim’s early projects included videos for builders, realtors, fitness professionals, airshow performers, doctors and even a TV pilot for Wings, the predecessor to The Military Channel, and a pilot for The Outdoor Network about climbing. Formerly an actor trained in Theatre and Directing, Jim is adept at directing actors and non-actors on camera. Jim understands how important it is to make people comfortable on camera, so they can portray the feelings and message important to the production. He has filmed interviews with such celebrities and notables as Jay Leno, Dr. J, Zappos founder Tony Hsieh, Paul Mitchell founder JP DeJoria, WebMD founder Jeff Arnold and many others. An accomplished cameraman, Jim has filmed in the deserts of Baja, in the wilds of Africa, on the greens of Pebble Beach, in the pits at Road Atlanta, and even on the glaciers of Iceland. He’s just at home on the set of a TV studio, or the boardroom of the executive office. He’s been the Director of Photography and Camera Operator for the Atlanta based comedy TV series Bless Yer Heart and the DP for fourteen episodes of the Fantasy Web Series Suspension of Disbelief. In 2017 Jim added two feature films to his resume, as he was Director of Photography for the independent murder crime mystery feature End of the World Rocks, as well as worked with the Visual Effects team on Godzilla! King of the Monsters for release in 2019. Jim is also available to speak at your event or corporate meeting about the importance of video on the Internet, video marketing topics and video production.